CTF-Ranel, by David M�nnich, is a fun map that plays well, has some good sights, and enough variations to keep things interesting. The map is symmetric in its design, and offers you several ways to bring home the goods: You can use a direct approach and ramp right up to the flag, or attempt the eye-level assault route. Then there is the sneak attack where you can loop around from behind and hope for the best. Any way you try is a challenge, and once you've obtained the flag the return trip gets hairy with a horde of bots on your tail. There are some lifts, catwalks which allow for vertical bombardment and alternate routes, and crates to block long views and add cover. Even though there is plenty of geometry for shielding, you still have a wild ride as you zigzag your way back to base. The textures were block, steel, wood, and modern panel. Stuff is trimmed out, places highlighted with fencing, and a skybox which implies that it's dusk. The bots were all over me when I tried this 4-12-player map maxed out with 12. They seem to avoid the lifts, but they will use up the rest of the place, even taking the indirect approach for the flag. They defend well, work as a team, and make your work difficult if you're thinking about strolling home with a flag. The item placement was good. I liked the fact that you could use a sniper rifle to scope out bots on the long route at the perimeter of the building. The lighting was not overwhelming. There's some nice colored lighting to let you know which side of the map you're on, but I wished a few of the red light fixtures were a little more reddish. I didn't notice any ambient sounds, but the lifts make noise, and you have some music to get you in the right state of mind. Nice map, but I've seen it before. Seems to me like DavidM can just rip out these top-notch maps without lifting a finger... amazing. I'd like to see more high-poly work from David, though. Plays ok and looks good. I say it is worth an 8. /me agrees with Fragswill + the lighting is ugly to say the least. Fun for a day or so tho. I liked this map. Phear the ubiquitous crates. Acceptable 2 fort level with good gameplay and average graphics. 10... - 3 for the layout - 2 for the lightning + 1.5 for the architecture. Next! I like almost all David's works.The style of him maps pretty nice, and this map done well.All the shortcomings is it 0.5 points that doesn't allow CTF-Ranel get a 10. This is not DavidM:s best works. I hate the lightning in this map. 8.5 for lightning,what a h...!!!!!!! NOTE: this is a map nonapt for cardiac, and all your base are belong to us. fun gameplay, barely a straight route in the place makin it easy to return the flag, but hard to keep it..
Man, this is brilliant....David, you da man! Yeah, very good and fun map. nothing AMAZING, but solid fun and not many stupid tricks to ruin it like many other maps. Makes me wish DavidM would make more CTF maps. bueno,pues...este...mmmm...�que podria decir acerca de este mapa?,pues para pasar el rato esta bien,pero deja q pase algun tiempo y desearas mejor jugar ctf-twinvalley o ctf-november. 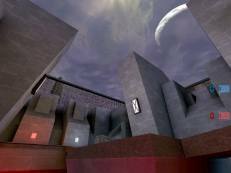 A truly awesome CTF map, perfect texturing, with the UT tech in the blue base and the industrial stuff in the red base. I didn't see any problem with the lighting. Some epic CTF matches have gone down on this map on my computer, and it should too, on yours! >Fun, symetrical, good bot support, like the layout. Yeah, ^ScreeN^! It's my rotation map too! I'll never go sleep if I didn't play it for a bit of time!